V. Ramamurthy is Professor and Chair of Organic Chemistry at University of Miami, Coral Gables, Florida. 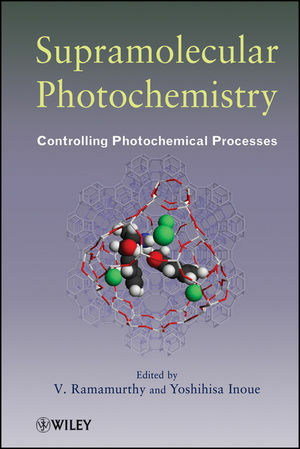 The author of over 330 publications, editor of twelve monographs, guest editor of five special journal issues, coauthor of a recently published textbook Modern Molecular Photochemistry of Organic Molecules and Senior Editor of Langmuir, he received his PhD from the University of Hawaii, Honolulu. Before joining the University of Miami in 2005, he was employed at Tulane University, New Orleans, Louisiana, DuPont in Wilmington, Delaware, and the Indian Institute of Science in Bangalore, India. Yoshihisa Inoue is Professor of Chemistry, Osaka University, Japan. The author of more than 400 scientific papers/reviews, thirty-one book chapters, and the editor of two books, Professor Inoue received his PhD in chemistry from Osaka University, Japan. He started his academic career as assistant professor of chemistry at Himeji Institute of Technology and was promoted to associate professor before returning to Osaka University as full professor in 1994. He has worked as director of the ERATO Photochirogenesis Project and of the ICORP Entropy Control Project, both supported by Japan Science and Technology Agency.